We didn't really plan to have an only child. I had always thought that we would have at least 2 children until it almost didn't happen for us. At 41, we are very blessed with our miracle baby and are blissfully happy with one. However, after the NICU and all of the difficulties making it through the first year, I'm having to reconcile with myself that there will not be any more babies. There have been lots of hard pills to swallow when it comes to this, and to many they may sound selfish. But, they are real. And, I'm certain that I'm not the only mother to have gone through this. Holding him while beds are being changed. This only happened because of sweet nurses! First, I really feel cheated that I didn't enjoy a normal happy pregnancy. Its an odd thing to see people in the last trimester of pregnancy. I didn't make it that far, and cannot relate to pregnancy in those stages on any level. I think that there is a part of me that will always wonder what that would have been like. Pregnancy for me for uneventful at first and easy. But after 20 weeks, I was terrified and living day by day hoping to make it just one more day closer to my due date. When I see happy pictures of mothers holding new babies after delivery, I sometimes cry. 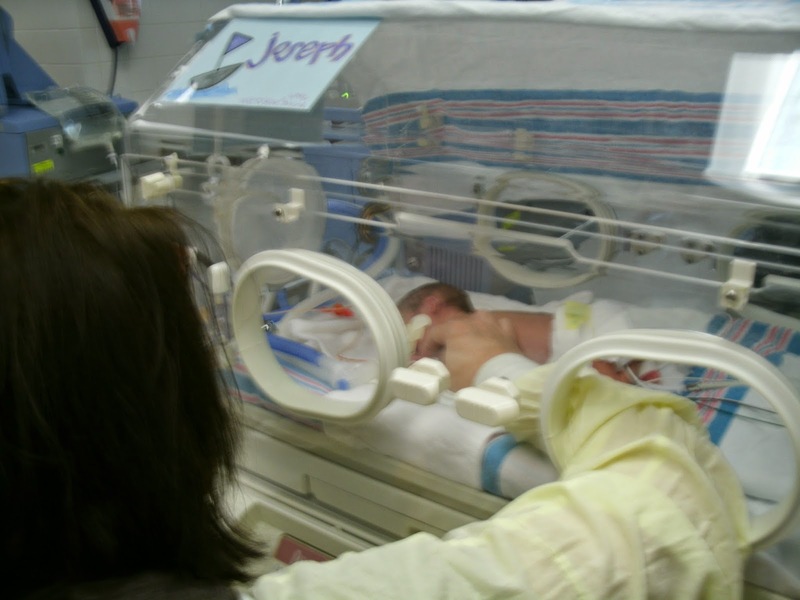 Its a sad reminder that I was able to view my baby through a box while I laid on the table in the delivery room watching them hurry him away to the NICU. We spent 3 months watching him through that box and graduating to a bigger baby bed before really being able to hold and cuddle him like most mothers. Even after graduating from the little box he outgrew, our little one remained on the vent through his first Christmas and several more weeks. 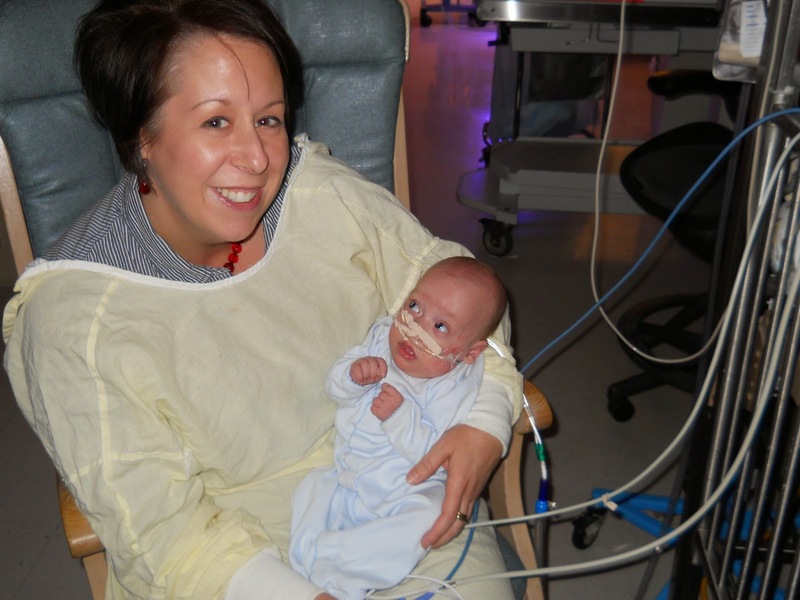 We watched him grow while being carefully tended to by loving nurses for 16 weeks before coming off the ventilator. So, every first and event is an EVENT! A big one. I have tried to treasure every bit of motherhood because I know that this is it! It isn't a dress rehearsal for the next one. We will not have hand me downs or other babies down the road. He is the ONE for us. I worry some days that this may make me a smothering mother that is just too much in every sense of the word. Then, other days, I think that it may make me a better mother because my existence is devoted to him. Mostly, I am coming to terms with the fact that motherhood for me is a bit of both grief and joy. I feel sadness for somethings that I wish could have been in my life as part of happy pregnancy and start to motherhood. But, I am also aware of the wonderful joyous life that feels our home. And I know motherhood is part joy and grief for probably every mother. This is mine. During the first months that we were home from the hospital, I was figuring out how to handle the day to day functions. Do I let him cry it out or pick him up? One night I found myself picking him up and crying right along with him while trying to calm him back to sleep. 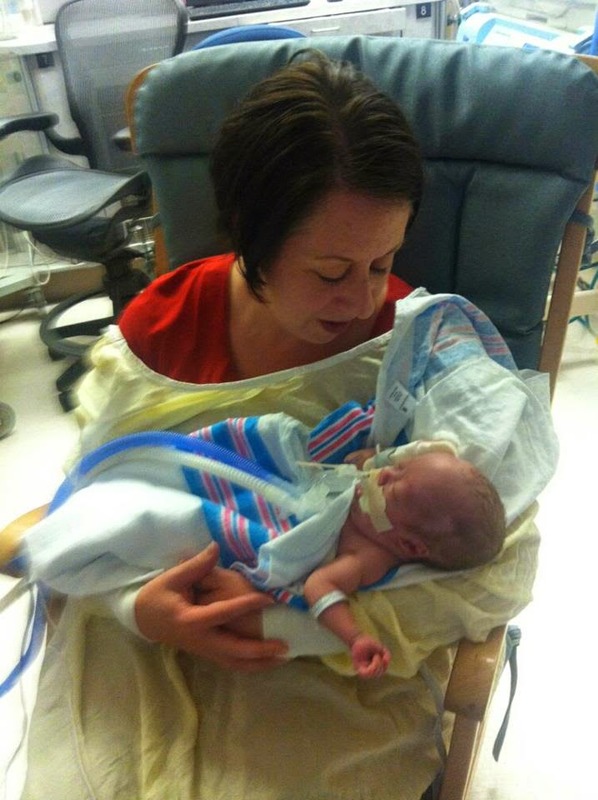 We had spent such a long time waiting to hear his cry while on the ventilator. Finally, we could hear him cry. For so many months I struggled with how to comfort and soothe him while he was very sick and fragile. But our only means of doing so was a hand on his back or wrapping his hand into mine. Now, we can hold and comfort him any time. And we do it often. Yes, I know about crying it out. This is the most difficult part of motherhood for me on some days. I simply cannot let him cry because I once knew the helpless feeling of watching that "cry face" and not being able to help him. These moments are the ones that remind me of the importance of motherhood and help me to reconcile with the loss of what is never to be. I pour myself into this child and his needs, and cries and desires. I may never live to see grandchildren or other babies in my arms other than this one. It is part of being an older parent. But, our one and only brings me joy and laughter through the tears that I still sometimes cry. I am reminded every day to be thankful for our sweet miracle. I feel like the honesty of owning the longing to have had other children is normal and okay. And hope that one day my son will realize how much we truly wanted him and love him because he is truly our one and want nothing but the best for him. Bath time and its accessories certainly add to the amount of baby gear in the house. 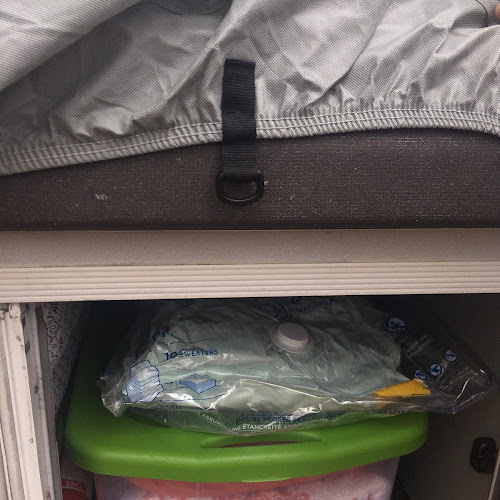 In a small house, storage is at a premium. But, in any house, organization is key. One thing that has kept me sane with the mountains of gear in our small home is organization. For every item or group of items, I'm thinking storage solutions. Well made toys that wouldn't mildew and would stay clean. Something to store items easily. The toys I chose are good for hand eye coordination and fine motor skills. It has been a fun addition to our nightly routine. Bright, happy colors aren't a bad way to end the day either! 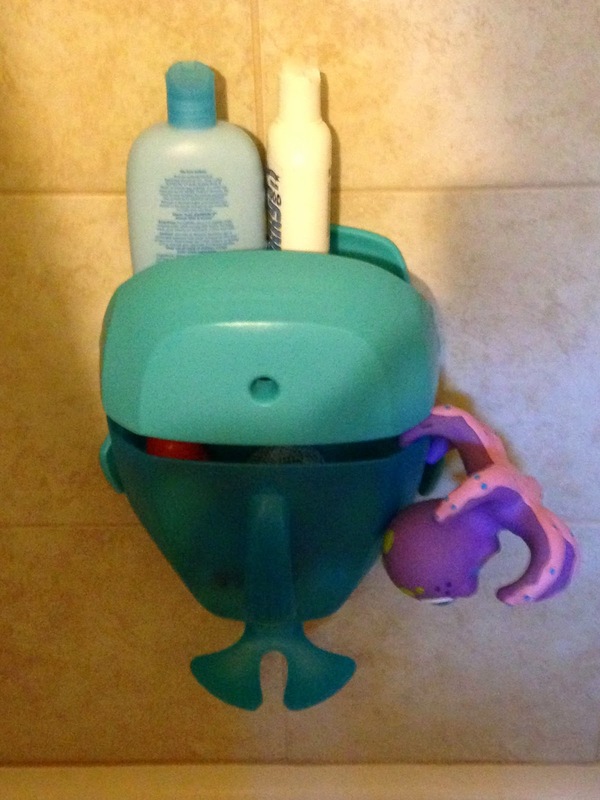 For our storage solution, I selected the Whale Pod Bath Toy Scoop and Storage Solution. The bath pod hangs on the wall of the shower. There is a caddy on top for bubble bath and shampoo. 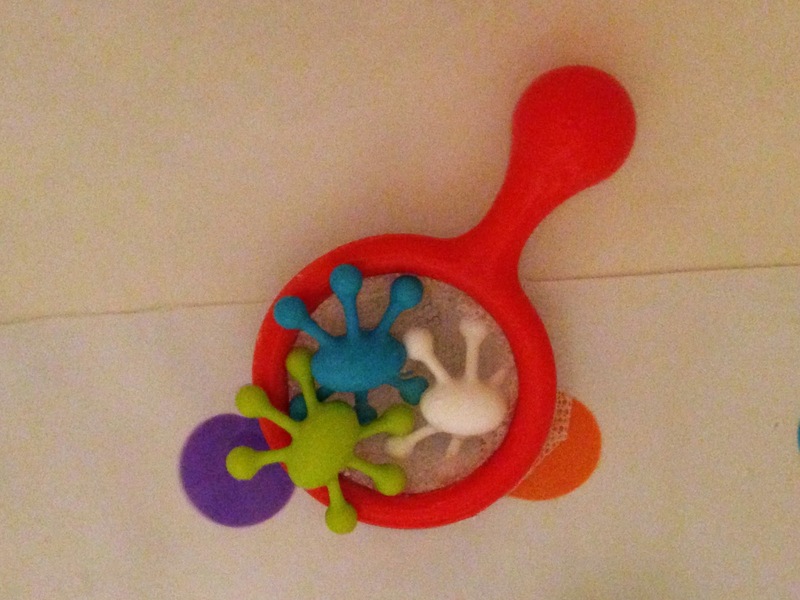 The scoop underneath can be used for scooping the the toys from the bath tub and drains off the water. One recommendation, the foam adhesive tape doesn't hold well. I would encourage you to find something like a 3M outdoor permanent foam tape for this. It will hold much better and is typically water proof. This is a great solution for keeping everything out of the way and easily accessible. 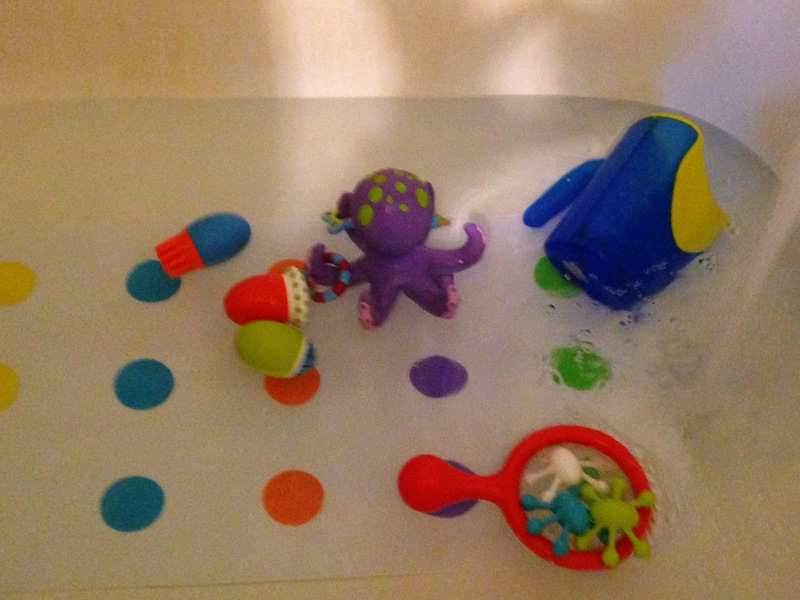 If you are looking for bath toys for your little one or for baby registry. These are great items that have been fun for our little man. Or, if you are looking for a gift for a new mom or small child, these are great items. Build something fun into your nightly routine. But keeping it all put in its place make your bath time routine more enjoyable. No one wants to fight with rubber ducks and boats to take a shower or get to the sink. Everyone at our house has our gear and our space. Help! I'm buried in toys!!! Toys and gear in general are spilling over in every room of my house. Keeping everything put up is a mere means of survival at this point. When you start prepping for your new baby and as all of the stuff starts to multiply, have a storage plan. If not, you will start to loose your mind! Yes! It is true. My favorite storage containers are fabric baskets. There are lots of different places where these can be picked up. And, you can even have containers custom made to coordinate with your nursery or your living decor. 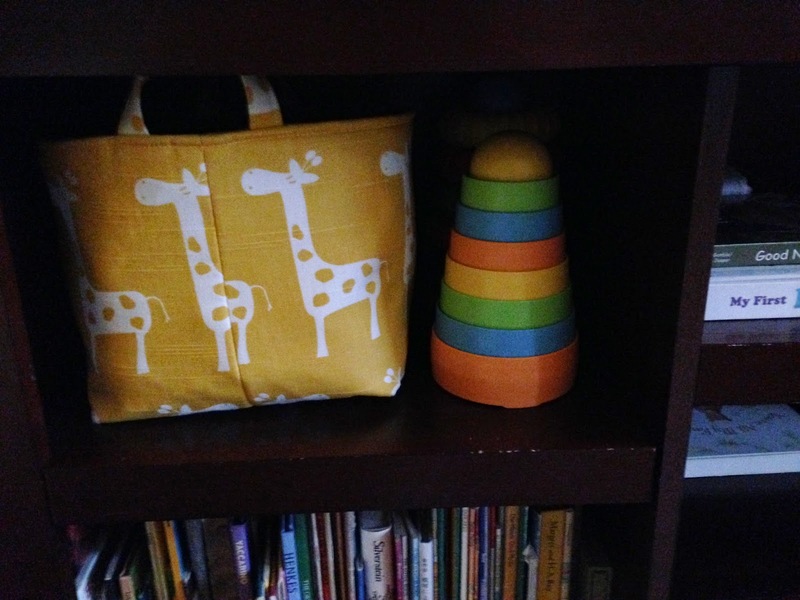 Small baskets, bins or tubs for items like teethers, small cars, or other developmental toys. Medium baskets for bibs, smaller stuffed animals, balls, etc. Large baskets for larger stuffed animals and plastic toys. 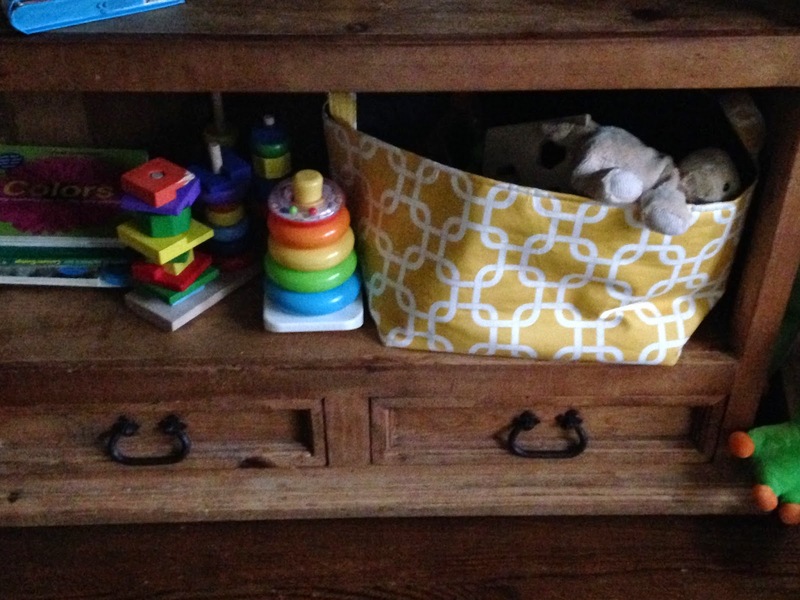 We have organized baskets and bins in the baby's room on shelving. Taller furniture allows for storage underneath. Everywhere is a possible storage point. Plan wisely and shop for furniture accordingly. In the living room, we have cleaned off the bottom shelf of the bookcase for baby items and a bin. We have also placed some bins with toys in the living room. Our main plan of attack is to have a place for toys to be scooped up and into at the end of day. Grab a basket, chase the wreckage, and done! Its an easy way to end the day! Baffin Bags on Etsy is my favorite fabric bags that we have purchased. They have held up great and look fantastic in King Diapers room! These bags are worth every penny. And they have lots of sizes, colors and patterns. We also found some great baskets that look fantastic in our living room at TJ Maxx. I would recommend this as a go to for baskets. TJ Maxx always has home decor items for storage. Tuesday Morning is another great spot for storage items. Also, if you are looking for more storage in your living space, consider an ottoman that doubles as storage in your living space. A chest or trunk would also work. This can be used as your coffee table and can tuck in toys at the end of the day. 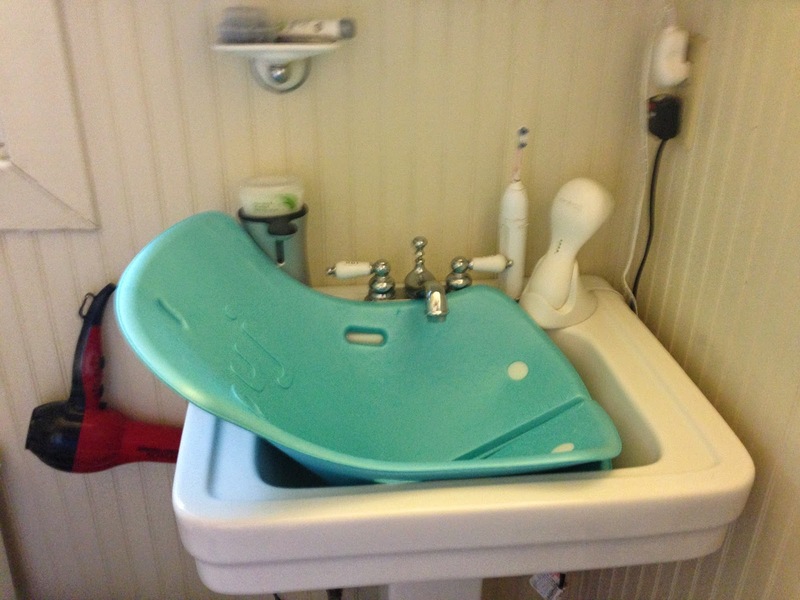 Whatever your plan of attack is for the baby gear, think of bins, baskets and tubs. Look for items that fit into your decor. This will help you to feel like you are keeping your house organized and looking put together. And you won't feel like you are living in a day care. There is no way to hide it all. Your house is going to be baby central. But, a plan for all of the stuff will make it manageable on a day to day basis that will help you to keep your sanity. Push presents have become a fun new tradition for new mothers. When King Diaper was born, Craig gave me a very special necklace that has the imprint of our little one's thumb on it. It is truly a special gift that I love dearly. However, dads seem to get the shaft at times when it comes to gifts. I recently heard a dad telling about his traditional shorts and tee shirt gift for fathers day. While he was smiling and very much loved his family, just like anyone, a thoughtful and unique gift is always something cherished and special - even for dad. 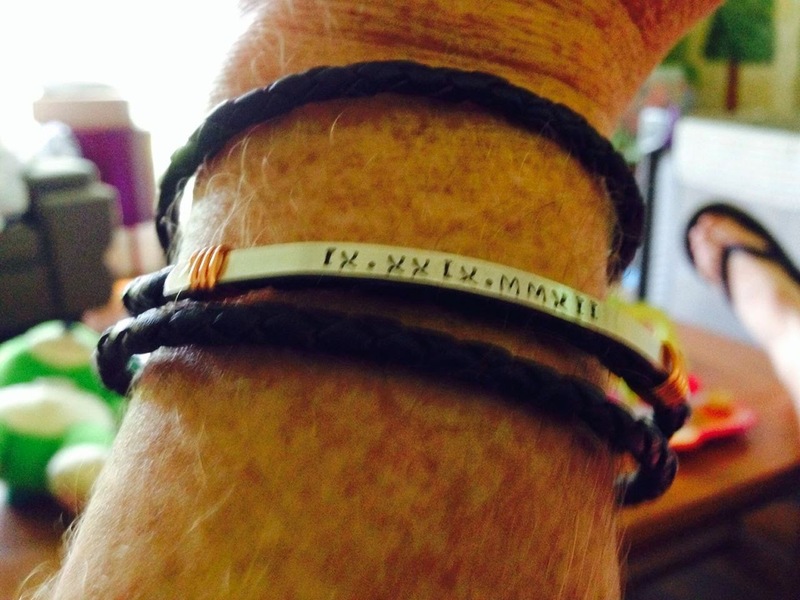 This year for Father's Day, I ordered Craig a custom made bracelet from Blue Giraffe. This bracelet is made a braided leather. It has a magnetic clasp. Featured on the bracelet is King Diaper's birthdate in Roman Numerals. Underneath is his name. I really thought that Blue Giraffe did a great job on the bracelet. It arrived in its own little gift box with confetti and displayed beautifully. Plus, I was able to order directly from my phone app! Score! And, if you are looking for a unique gift for a new mom or grandmothers, Blue Giraffe does have items for her as well. 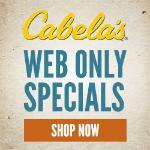 I will most definitely order something from this site again! Finally, this is a great place for gifts for you own parents and grandparents. Whatever the occasion something personal is always special. 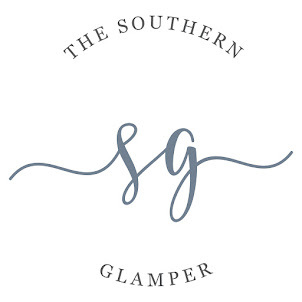 Your mom or grandmother might need a monogrammed gift from you. I love the unique and personalized. These gifts say "I thought specifically of something for YOU". It is something that lets your loved one know that you spent a little more time on the gift than a rush up the aisle at Walgreens or Target. Happy shopping and remember that great gifts won't drain your wallet. Just look for creative options from vendors that provide options just for you! I have planned for working out while traveling for as long as I can remember. Over the years, I have learned that these are the best work outs. Most people are inclined to think that time off means time off. And yes that is true, but vacation work outs are totally different! First off, on vacation, I feel like anything is better than nothing. I'm not really feeling that anything needs to be accomplished. I try to make it relaxing and tie it into the scenery or something that I've wanted to do. The pressure of being in a time crunch to get in a work out is gone. So I start out relaxed about doing it and in a different state of mind from the start. While in Puerto Rico for Christmas a few years ago, I bought a package of sessions at a local yoga studio. I loved every minute. I improved my practice and worked out with great instructors. Lots of great vacation spots have studios devoted to just that. Its something that can be both fun and rewarding at the same time. Recently, while in Montana, our hotel had bikes for guest use. My brother in law met me on the first morning to show me some local trails. It was a great way to start my morning and enjoy the scenery. 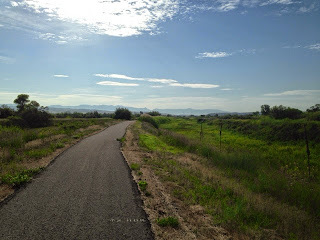 After that first morning, I went each additional day and went a little farther each day. I left Craig and King Diaper in the room to enjoy breakfast. When I returned, everybody was happy and ready to start the day. The same is true for the beach. 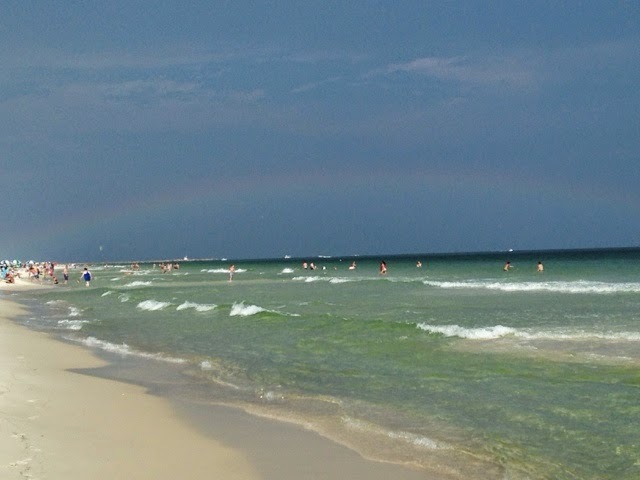 A run or walk on the beach can start or end a day. I skip the headphones and enjoy the waves. It is amazing how quickly the time passes and how much father you will go when just enjoying the scenery and the sound. Here are my rules for vacation work outs. Tie in opportunities for nature and scenery in a new place. Don't make it a training session where you have so many miles or something to go. Enjoy and stop! Toes in the sand while getting in some cardio! If you still aren't convinced, why not try skipping the car rental or driving somewhere. Walk to dinner or shopping for some added movement in your day. No matter where you are or what you are doing can allow you some time to move and "exercise". I have found that working out on vacation just clears the mind. Its a way for me to mentally leave the day to day stress of work and home behind and enjoy something new by changing my mind set. For some, it is easier to switch mental gears and just go into vacation mode. I seem to need a little prompting. This may be because I'm in constant movement all the time as it is. But, whatever the case, it does work for me. Bottom line, I love to work out while traveling. It is something that I think I'd be sad about if I didn't do it. Enjoy your downtime but make it active. You'll be glad you did - both mentally and physically! My mother doesn't know how to swim. I suppose this is what drove her to sign my sister and I up for swim lessons in the summer. 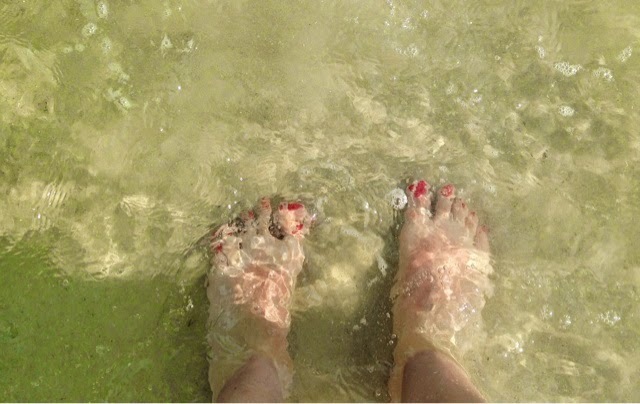 I was afraid of the water and didn't want to do it. I would sit on the side of the pool with my back to the water in my silent, visible protest each week before being coaxed into the water. As an adult, I'm not a great swimmer. I have tried my hand at swimming laps, and I'm certain that the lifeguards earn their pay on these afternoons. The lifeguards site patiently watching me dredge back and forth and waiting for me to fall into distress - nearly drowning. Okay. So a little overly dramatic, but I'm not a good swimmer. A baby pool is more about my speed to be honest, but that's another story. show that sad face and scene! I would like for King Diaper to learn to love the water. His daddy was a swimmer in high school and played water polo. We are starting early to develop a love for the water. It is amazing considering that he was 7 months old before his first bath. And, he screamed like a maniac every night for quite some time before accepting his fate at bath time. Now, bath time and any water experience is fun and enjoyed. I would have never thought so considering that first bath. 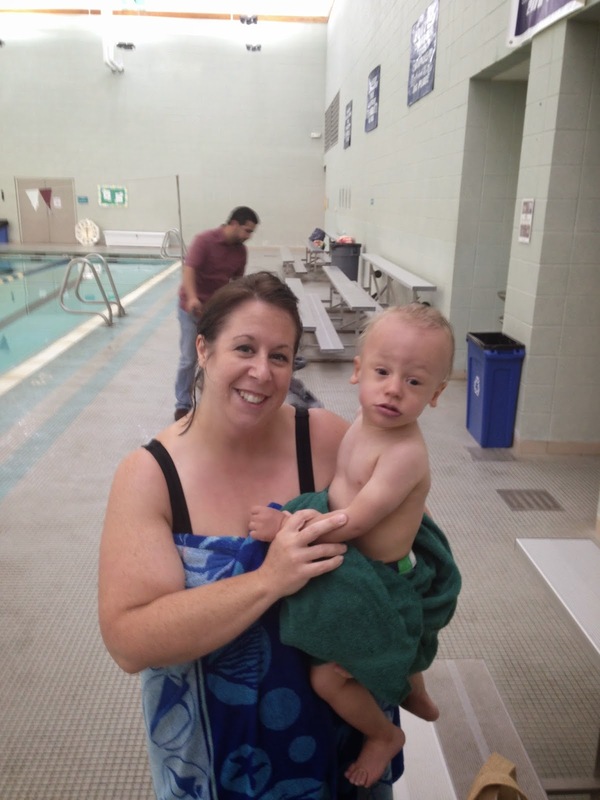 This summer, we signed up our little man for swim lessons. Our class was given at the local university for 30 minutes 4 days per week for 2 weeks. 8 total lessons. For $45, it was well worth it. King Diaper loved getting in the water and fearlessly bobbed around each day. We learned about ways to work with our child in the water. He was not able to blow bubbles during this first class, and he resisted floating on his back. But, I felt like this was a good start to learning how to swim. I feel certain that next summer we will do another session of lessons. In addition to the lessons, we signed up fora summer membership to the gym for the pool. We are really concerned about instilling the importance of being active in our little one. We also want him to see us being active and involved with him. I don't want to be a passive parent that is always on the sidelines. Being on the side has its place, but being active is a good thing. These kinds of activities give us a chance to do something fun and gets us out of the house. Hopefully, when the little one is big enough, he will pick some type of sport or activity that is fun. It doesn't have to be swimming. But, at least we are breaking the ice and giving him a good start to discovering new things to do and facing them head on instead of having his back to the water! after a good night's rest! 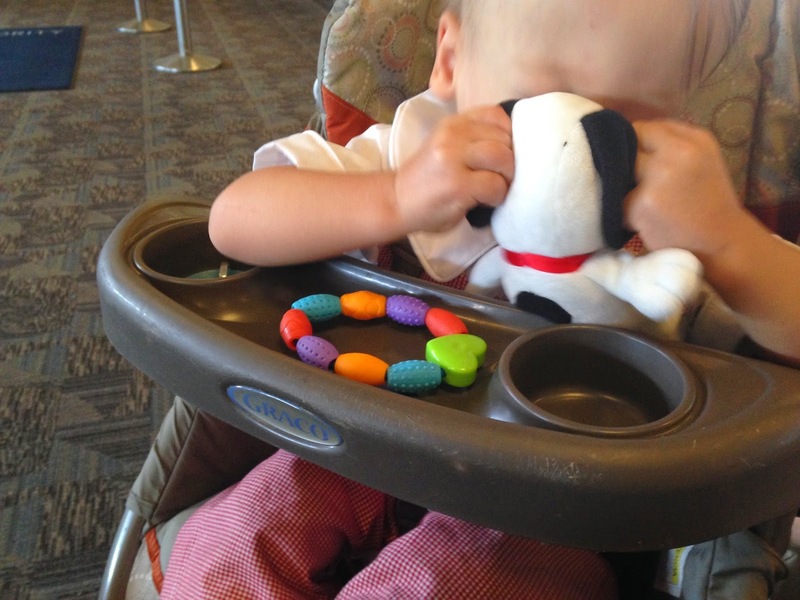 We have done lots of little road trips with King Diaper, but air travel is new territory for us. I travel more solo for work. Incorporating both my guys into a trip is an adjustment to say the least. 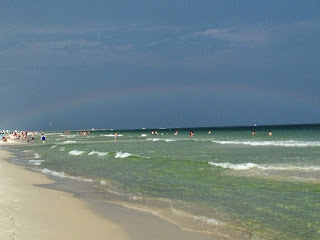 However, I think that travel is something to enjoy and not dread - even if it involved airports and rental car lines. 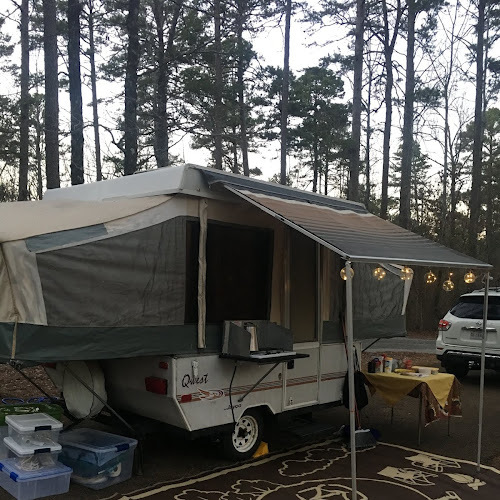 How did we fair for our first big family trip? It was overall an awesome trip. There were a few little melt down moments here and there, but there was noting that makes me look back think that we won't try a big trip like this with out little one again. We really enjoyed it. Planning and the prep work ahead of time made a big difference. Think it through. What do you positively have to bring that you are going to toting around? And, what can you pick up on the fly to lighten the load? For example, do you really have to pack all the snacks you are going to need? If it takes little space and travels easy, then take it. But, we eat lots of fruit. I can pick that up in the airport. I'm not packing fruit. But, cereal bars, etc, this is my squirrel food that we take! Also plan wisely with the toys you take. Eliminate noisy and big toys. Plan for security checks. Dress accordingly. Maxi dresses and simple shoes can be done while looking put together without showing up in your PJs. Also, leave the clunky funky jewelry! throw a fun scarf or wrap on and call it a day. It can be your fun accessory and keep you warm all in one whack! Make sure that shoulder straps fit comfortably and are not overly heavy. Test everything in advance. Otherwise you will be cursing all the way through the airport as you try to survive the day while juggling a child. Don't shy from checking luggage. I'm over people that have overstuffed bags that fill up overhead bins and take the the isles while they shove stuff that will NEVER fit and then have to get help from the attendants! CHECK YOUR BAGS!!! Unless you are traveling alone, you are NOT going to fit all of the stuff you need into carry ons for all of you. Trust me. Juggling a baby, big carry on bags and whatever else you need will make you crazy before you get half way through the airport! The price of checked luggage is worth your sanity. And mine. I thank you in advance for checking those bags - and if not, I'll be giving you the stink eye from my seat or the isle while I wait. Make lists before leaving. Make a list for each person and what they need to take. Make a separate list of what you will need to pick up for baby when you get there. And there will be things. The easiest way to do this and keep track is using apps on your phones. I like using Our Groceries. My husband and I have this on both of our phones. I can make the list and it syncs with his phone. He can update and change as needed. This way we are both organized and aren't digging around for crumpled up paper! Pack only the diapers you are going to need to travel. I packed about 6 in my diaper bag. We picked up a pack at the store once we got there. I did pack a night time diaper for each night. I didn't need to buy a whole pack of them and this didn't take up as much room. Also, throw in a couple of swimmers if you think you will need them. Items like this won't take up a lot of space and don't come in small enough packs to warrant separate purchases for just these. Regular day diapers are in high demand and are easy to get on the go. I'm not going to profess to be an expert here after one trip by plane with King Diaper, but I will say that I feel more confident about doing it again given our recent experience. Here are some things that I feel made it go well. Napping on the way home. Leave early! It may mean that you go against your instincts of waiting until everyone has their coffee to leave, but trust me, this is a good thing! We got our guy up at the last minute, threw on his clothes and left. He was happy, alert and not too tired to be satisfied during the day. Plus, this helps keep your little ones on schedule by getting to bed at a normal time upon arrival, etc. I don't really want to talk about number two, but I will. This will probably be the only time I will ever talk about this on my blog, but it can and does happen in the air. Don't panic. I had to change king diaper in that little bitty bathroom on the closed lid of a toilet seat. Not fun or a great mental image. But, I just sang and talked calmly to him so that he wasn't scared in a crazy position and strange environment. Over. Done. And nothing terrible to it. Just keep things like a diaper, wipes and changing pad handy so that you can grab and go when it does happen. Let me stress again - CALM. It goes farther than you think! For you and everyone else! Plan for layovers and possibly an extra stop. I know. Most people think that getting it all done at once is better. For us, no. On the way, we had one stop. The long 4+ hours on the plane all at once was almost too much. On the way home, we had 2 stops. He slept for two hours during the first flight. He had breakfast and played with his toys and books on the second. We had a nice leisurely lunch at the airport next. Then he slept on the last hour flight. It was much better. Skip the train and walk in airports. 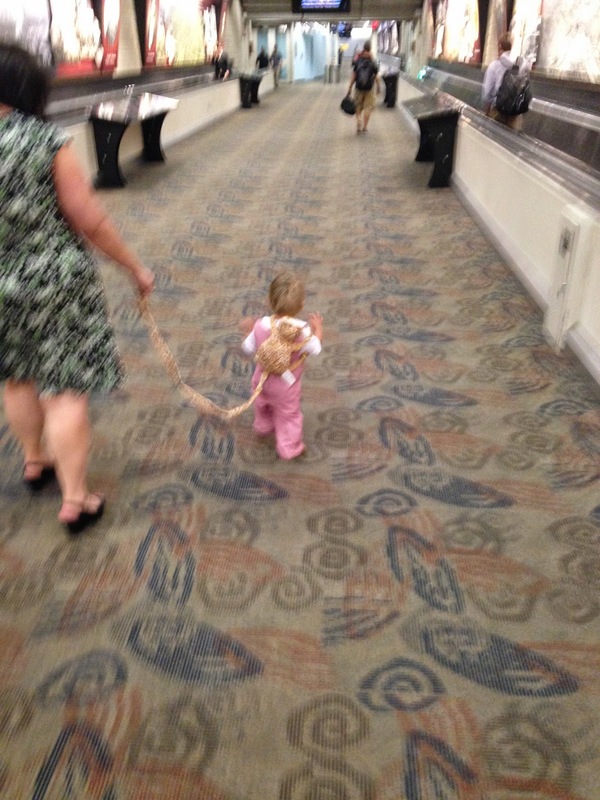 Unless you are running to your next terminal, walk! Let the kids walk and just allow them to run off some steam! It also allowed us all to score some extra steps in on the handy dandy Jawbone UP! So, everyone wins! Snacks are key! I had planned for things like granola/cereal type bars, puffs and that kind of thing going. Even those squeeze pouches of food work great. But, look for kiosks that have cheese, fruit, yogurt, etc. It may be expensive, but these items are better than junk. Nothing is cheap at the airport so make it count! And finally, save your money on milk and ask your flight attendant for some so that you don't have to buy it at the airport! Ibuprofen. Give it to your child in flight about 30 minutes before landing to help with ear aches due to pressure. I know that lots of people say medicate your kids with Benadryl, but I have also heard parents talk about it having the opposite affect on children and making them hyper. We rolled the dice and did fine. If you are in doubt or concerned, ask your pediatrician or local pharmacist. They should be able to recommend a safe solution if you feel that you need to provide your child with something to made the ride easier. Pack toys and items to keep your child's attention in a small backpack or tote that you can store under the seat and easily pull out without digging into the overhead bin. We packed a few thin books. Highlights are great for kids on a plane. Also, we have Scout that is a programmable dog with songs that are fun. The volume can be adjusted so it doesn't disturb everyone. And a couple of other small items. I would recommend pulling out things your child enjoys but hasn't played with in a while. He or she can rediscover it on the trip and enjoy something "new" all over again. Use your phone for entertainment. I have this app on my phone called Play Kids that has little PBS Kids shows like Caillou, Super Why, and Daniel Tiger. This was an easy compact way to entertain as needed on the plan. Other apps like Petting Zoo are fun and entertaining for small children. Finally enjoy your trip! If you forget something, it is not a crisis. Just pick up what you need and move on. Don't try to do everything. When you are tired, stop and rest. Killing yourself to pack it all in just makes for a miserable day! And schedules are key. Naps and reasonable bed times are a must for everyone involved. After all, you are the grown up. Take charge and take a mental health break. You will be glad you did! And so will everyone else you encounter. There is nothing worse that worn out, grumpy children that are out of control because they are too tired. 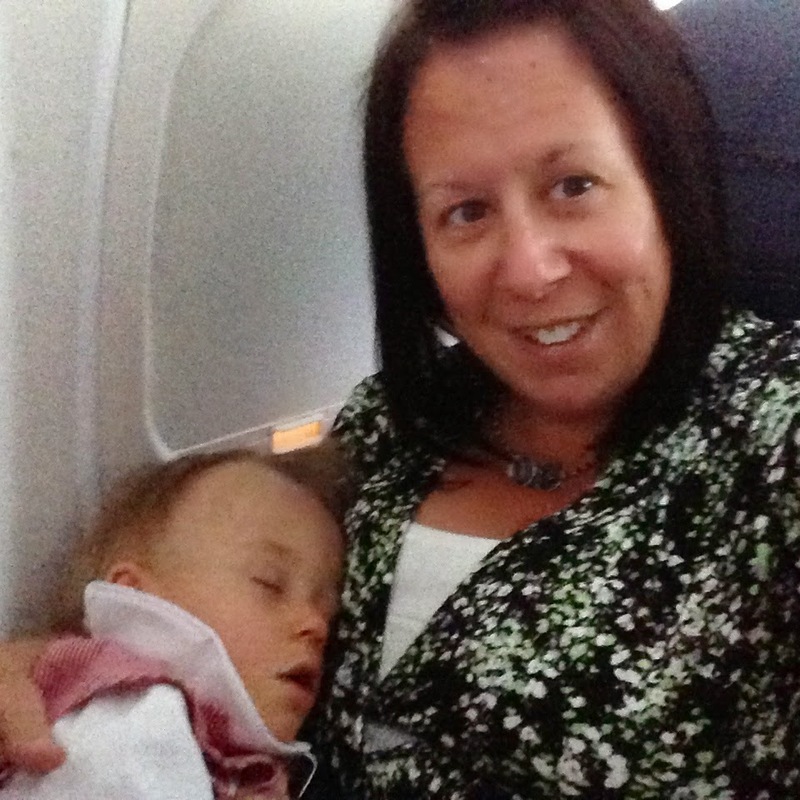 My good friend Susan kept schedules for her kids on every trip for all of the years I have known her. She said it was the only sane way to survive any trip. She travels and has a big time every where she goes. My friend Elizabeth is the same way. Her children continue to have a regular bed time even while out of town. Everyone is happier. 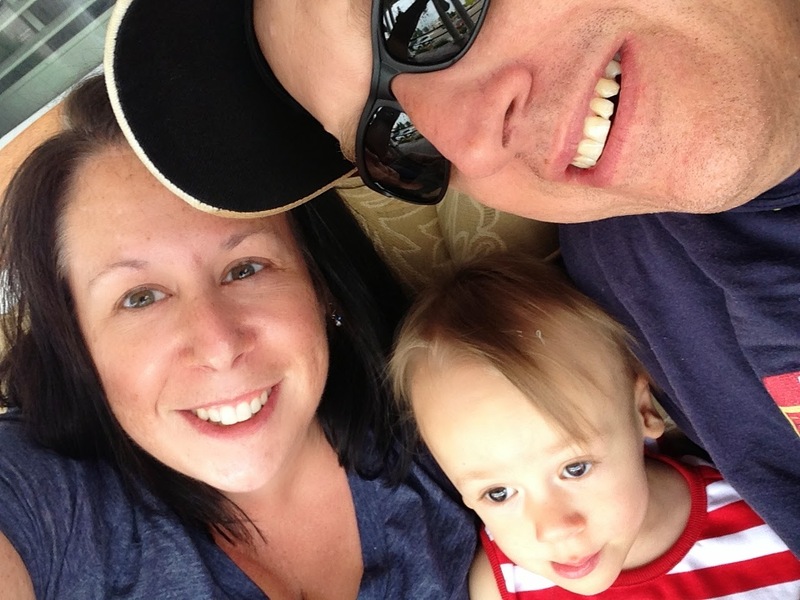 So, take your cues from other parents that have survived little ones and travel. I've watched for years and seen what works and what doesn't. My husband and I both love to travel. Traveling early with kids and often is a good thing. We have enjoyed doing little trips as a family. This was by far our biggest one, and we feel up for the next one already! Plan a trip and settle in for the ride. Seeing the world through the eyes of your child is so much fun. I can't wait to see where we go next! Having a fitness goal is something that keeps me going! I like to have something to work on that breaks up the routine. During the month of June, I did the 30 Day Ab Challenge. This is the fitness challenge went viral on Facebook. It was a great way to kick off the summer. I'll fully admit that the first several days were terrible. However, over time, I noticed that my body got stronger and the daily routine was a little easier. Notice, I didn't say easy. It just wasn't as difficult to complete as the first day. If you have not been working out, take it easy and talk to a doctor first. Do as much as you can do each day. If you are unable to complete a day, then this is okay. But, push yourself. Take a rest for a few seconds if you have to. Pair up with a friend (even online) for accountability. How did I feel about it overall? I loved it! At the end of the month, I felt like I had accomplished quite a bit. 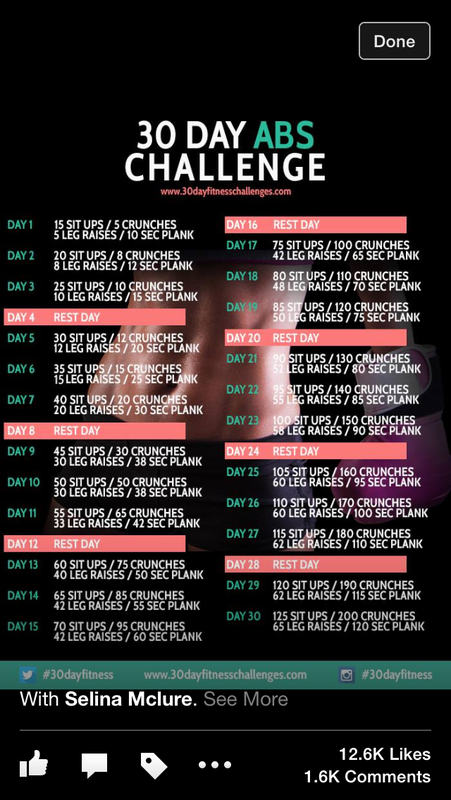 I hate doing abs, and this is something that I needed to challenge myself to do. While in the middle of this, I did some exploring online. What were other trainers saying about this? Also, how did others feel about it? Reviews were mixed, but what mattered most to me was how I felt and what I accomplished. At the end of 30 days, I didn't have a six pack. But, I had a stronger core and was stronger than I was 30 days ago. That is what counts! So, now I'm moving on to a new challenge. Lauren Henson is a Beach Body coach. 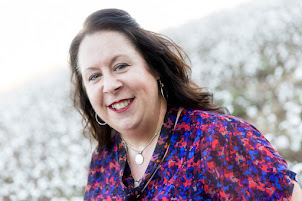 She has a Facebook Page Getting Henson Healthy where she promotes healthy eating, exercise and positive lifestyle changes. 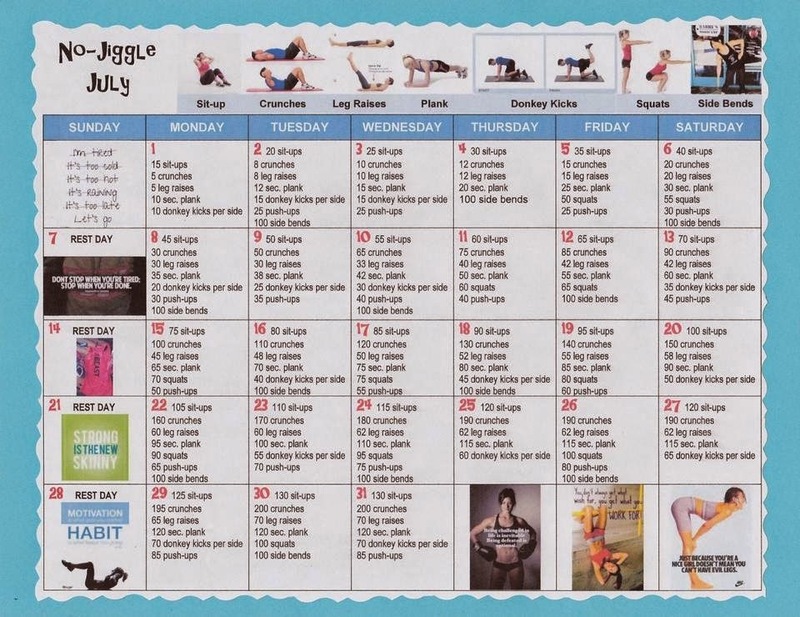 This month, she is doing a No Jiggle July Challenge. And yes, I'm in. Lauren is a lot younger than I, and hasn't had a baby at 40. But, I think that those can be excuses for me. These are also negative thoughts that can keep me from getting to that next place. Lauren's efforts are just about being healthy. Every step in that direction makes me, or anyone else, a healthier person. That, I can live with. Check out her page if you are looking for something to motivate you daily or for exercise and eating tips! I love the energy and positive attitude that is so encouraging. This can be more than half the battle for people getting and staying healthy. Lauren is committed to a healthy lifestyle and works to help others get there too! I incorporate the challenge into my daily routine. I work out daily. I eat healthy meals with lots of fruits and veggies. The challenge just becomes a part of what I'm already doing to give me a little bit of a push. The great thing about these challenges is that they can be part of a workout routine while traveling with or without a gym. No excuses! So get out there are look for a 30 day challenge that works for you. It has been a big motivator for me this summer and has kept me out of a slump. Have a great week and carve out some time for you. Its important that we all make "ME" time part of our daily lives for both physical and mental wellness! Happy Sunday! Mini-mergency Kit - What's in Yours? I like to plan for the every day "emergencies". No I'm not a pessimist. Exactly the opposite. Call it my plan for daily success. Having a kit on hand this kind of thing is essential to anyone who travels. And, this is not exclusive to moms or working women. I have a little cosmetic bag that I keep stashed in my bag for all kinds of daily whatevers. So, what's in my bag? Make Up Forever Pressed Powder Foundation - this is great for the mid day touch up or for long days that mean work bleeds over into evening! Lip Balm - just for when I need this and not lipstick! Tide Stain Stick - need I say more? Other things that you can add, travel toothbrush and travel toothpaste! Those are other life savers! This is a lifesaver on the road! I cannot tell you the times that I have spilled coffee on a top driving down the road or realized that my day was not going to end at 5! Planning for the unexpected is the best plan of all and simplifies life on so many levels. I think that this is also a way to decrease stress in many situations. Little spill on your clothes? No worry! I have a stain pen! Or, I'm working late and am going to meet friends? Sure! I can freshen up at work! Have a great week! Plan for your next mini-mergency and see how much easier life is with just this one little bag!